Are you wondering what licious means? At first I was but now I know. 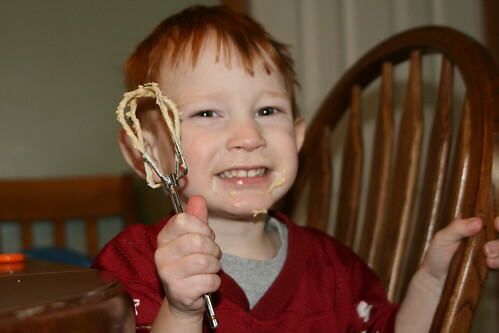 I heard it the other day when Kade was licking the beaters from the mixer. I was making roll out cookies and while I was using the mixer Kade came over to me with his hands over his ears. He asked if he could have a taste. I told him when I was done he could. (This all started with his first beater of chocolate cake batter months ago.) I finished up and gave him one beater. He took a lick and said "licious". At first I didn't understand him, it wasn't very clear. It sounded like he was saying itches. That didn't make sense. He said it a few more times and I figured out what he was saying, his form of delicious. Duh. Then he said, "Mmm, that licious." Then "Mmm, it's licious." Licious has now become "the" word for anything that tastes good. He used to use good or yum. His vocabulary is coming along. Here's a few pictures of the licious boy.